Until they are brought together on the football field, each hoping to resolve his own dilemma. But will they succeed? I enjoyed this book. If you're anticipating a football book, you're going to be sorely disappointed. This book more so revolves around gambling addiction, debt and one kids story of how easy it was to get into it and get hooked, as well as the repercussions that he faced when things didn't go so well. It was an entertaining, if not a tad bit predictable, listen. Regardless of whether I could see what was coming at the end for miles or not (I could), I still enjoyed the time that I spent listening and would recommend this book for someone who is intrigued by the summary, but again, understands that this ISN'T a football novel and is looking for a casual read that isn't going to make you think hard, just listen and enjoy. Alex Perlman did a good job with the narration. I think his voice fit Colt's character well and he voiced well-developed, unique voices for the secondary character in the book as well. The book was read with a good amount of narration where appropriate and I would listen to more books narrated by Mr. Perlman in the future. I was voluntarily provided this free review copy audiobook by the author, narrator, or publisher for an honest review. The story focuses on Newhouse University football player, Colt Walker, who finds himself caught up in relationship drama with his cheerleader girlfriend and a growing gambling issue. With every twist and turn, Colt finds himself facing obstacle after obstacle. I refuse to spoil all of the amazing plot twists the reader faces when reading The Fix!!! 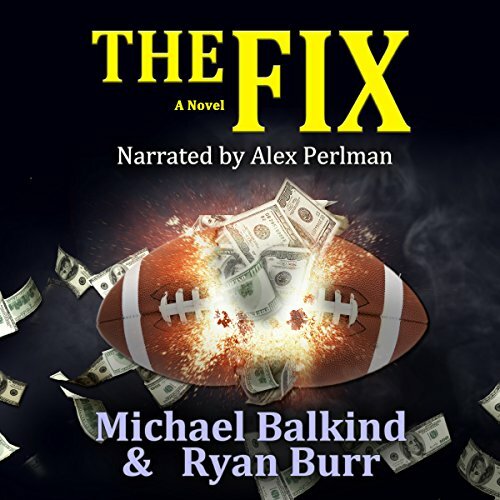 While the cover, and blurb, show that The Fix, leans towards a more athletic audience, anyone who loves a good story with many twists and turns, dynamic characters, and, of course, Syracuse, will find The Fix to be worthy of their time! The story, while fiction, sheds a valuable light on current issues and real potential, life-altering disasters college students (and anyone really) should look out for. Just as Beartown isnt' really a book about Hockey, The Fix isn't really a book about football! The Fix is more than a great story of a college football quarterback who is a contender for the Heisman. It is about addiction, gambling, and relationships. It is about addiction to drinking and gambling as well as relationships between lovers, friends, teammates, and mentors. From the first page right up until the end I rooted for; yelled at; cursed at and sometimes screamed out loud at the protagonist. I listened to The Fix and the narrator was as good as any I've listened to over the years. Never a dull moment and always full of energy when germane to the dialog. If you haven't gotten your feet wet with an audio book. This is a good one to start with. Both because the narrator is very good but also because as a first time user with audiobooks you get The Fix for free (if this offer is still available). Looking forward to listening to more books by Michael Balkind and hearing more narrating done by Alex Perlman. The Narrator helps make the story come alive and gives the listener an entertaining experience. Sometimes it's hard to find an audio book that will keep hubby interested on long car trip. This one was perfect as it had the sports element to keep him engaged. Since he is an athletics administrator at a college, he found himself so disappointed in, sometimes mad at, some of the characters choices, that it would leave him wanting to resume our trip/listening so the he could see how things would be resolved. Great fun story! I spent most of this book thinking no no no don't do that. The lead characters seem to make bad choice after bad choice to the point that it was almost painful to listen to. Yet it was very realistic and showed how easy it is to make a mistake and then more mistakes trying to fix the first one. The character development was spot on, everyone from the lead characters to the ones that really popped up we're realistic and came alive on the page. Descriptions were attention grabbing and allowed me to picture everything happening in my head. The dialogue came across as very natural, and the entire story felt like you could be taking place at a college somewhere right now. The narrator didn't excellent job with the mail character voices, the female character voices were OK but not particularly realistic. The overall tone and Pace of the delivery worked well with the different tensions in different parts of the novel. Often times, I need a easy story with a simple plot to follow for a lazy afternoon. That is why I requested this book from one of the authors for a fair review. "The Fix" is a casual read. Nothing too deep to think about, but also interesting enough to keep my spark lit to finish the story. The story is basic. It's about a college athlete getting in trouble by betting on sports and meeting riff rafts along the way. His gambling debts leads him even deeper in the hole and the ending is not as predictable as you may think. It surprised me with a Hallmark moment with a twist. I liked the main story part, some of the conversations were blah, and I honestly feel the author does not know a lot about football. Not faulting just that part was a disappointment to me as I’m a big football fan. The rest of the story was good so I averaged it out to a 3. This review was given in trade for an honest and unbiased review. I was very excited to listen to this book. As an avid sports fan, any story set in the world of sports piques my interest. The story starts off well, with the QB main character living a charmed life as a Heisman hopeful and a collegiate national championship looming in the future season. When Colt decides to bet a little in the offseason, he finds himself going from a winning streak to a losing streak quickly, leading him to make decisions that could affect his college career and NFL prospects. The story was pretty good, although predictable throughout. The one part of the story that wasn't predictable was the change in attitude and personality of the main character as the story progressed. Colt was bothered by inner turmoil due to his decisions but failed to do anything about it, which left me scratching my head. His mental weakness popping up whenever the circumstances weren't just perfect led me to wonder how a guy like this could have the mental skills to lead anyone, especially a high-ranking collegiate football team. I would have enjoyed this story more if I liked the main character, which I did not. We are led to believe this guy has it all together, but a little adversity left Colt with the mental capacity of a child, not a grown man. The other character (Frank) that obviously had a weakness in gambling and drinking had a much more plausible emotional ride, and I sympathized with him more than the main character. I was rooting for Frank, not for Colt, which I believe is not the author's intention. Once The Fix was set, the story blazed along wonderfully and ended well (although, again, predictable). The exposition was great, too. It was just the middle of the book that didn't match with the beginning and end, and while I understand why the author made those choices, it just didn't connect the story well. The narration was good - just the right amount of character voicings that distinguished the dialogue and made the conversations believable.